KC Poetry on the Move: Poetry Workshop with Barbara Varanka. Saturday, April 20 from 10:30 a.m. – 12:00 p.m.
KC Poetry on the Move: Featured Poet: Jessica Ayala. 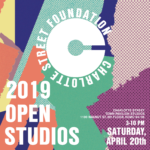 Saturday, April 20. Doors open at 6:00 p.m., performance begins at 7:00 p.m.
KC Poetry on the Move: Featured Poet: José Faus. Saturday, April 27. Doors open at 6:00 p.m., performance begins at 7:00 p.m.
All events are open to the public and located at Our Daily Nada at 304 Delaware Street. Details on all programs can be found at https://kclibraryfriends.org/kcpoetry and http://www.ourdailynada.com/events. The community-wide call for poems asked local writers to submit original works either inspired by Kansas City or with a Kansas City theme. Entries were reviewed and winners selected by a panel of local poets and writers. Lindsey Weishar holds an MFA in Poetry from UMKC and works at Literacy KC in Kansas City, Missouri. She writes for Verily and Ploughshares, and her chapbook, Matchbook Night was published in 2018. Alarie Tennille was born and raised in Portsmouth, Virginia, and graduated from the University of Virginia in the first class that admitted women. Alarie misses the ocean but loves the writing community she’s found in Kansas City. Alarie serves on the Emeritus Board of The Writers Place and coordinates Rose Garden Readings at Loose Park. 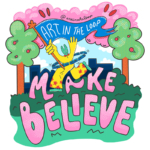 KC Poetry on the Move is working with local artists to take the winning poems and turn them into posters, which will be printed and displayed in the KC Streetcars and at KC Streetcar stops during the month of April. 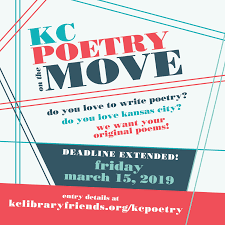 Winners are also invited to read their poems at KC Poetry on the Move events throughout April.